Creatine is a naturally occurring compound found in red meat and fish, and its role is to supply energy to muscle cells. Therefore it can be an aid to weights workouts as creatine can help provide energy when it is required the most – while it will not provide amazing gains in the space of a few days (as it is marketed to by some companies), it will help a bodybuilder squeeze out another repetition or two on an exercise, which over time can add up to considerable gains. Creatine can be found in foods but sparsely, therefore a concentrated creatine supplement is helpful (but non-essential to a bodybuilder who has already covered their protein, vitamin, mineral and essential fatty acid intake. 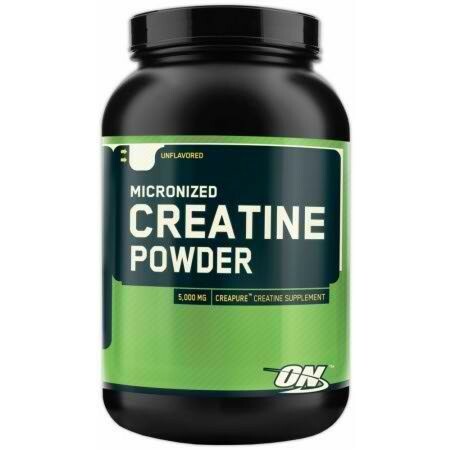 Creatine is relatively inexpensive and is available in two forms: monohydrate or ethyl ester. There is little difference between the two other than monohydrate is cheaper, but can cause water retention in some individuals. Additionally, creatine monohydrate needs to be taken with some form of carbohydrate to transport it to the muscle cells (due to the insulin rise). Ethyl ester does not cause water retention and does not need a carbohydrate transport, but is more expensive and has an unpleasant taste. Creatine is helpful to a bodybuilder but far from essential. My recommended dosage: 3-5g daily depending on bodyweight, plus 3-5g pre-workout (pre-workout means directly before a workout). By using the recommend dose, either mine or the one recommended on the label of the one you purchase then you shouldn’t experience any side effects that a minority report when supplementing with creatine. To take creatine you simply mix it in with some water or if you prefer, fruit juice.